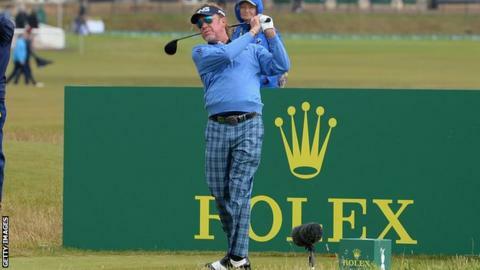 Miguel Angel Jimenez holds a two-shot lead on nine under par going into the final round of the Senior Open. The Spaniard, 54, held his nerve to par his final three holes at St Andrews, just missing a birdie putt on the 18th. Two-time Masters champion Bernhard Langer (-7) is tied in second along with Americans Tom Pernice Jr and Kirk Triplett, and Canada's Stephen Ames. Scotland's Colin Montgomerie is still in contention after a round of 72 left him on five-under-par.